표시 장치는 표시 패널, 복수의 광 센서, 편광 필름, 및 위상차 판을 포함한다. The display device comprises a display panel, a plurality of light sensors, a polarizing film, and a retardation plate. 표시 패널은 서로 마주하는 제1 기판 및 제2 기판으로 이루어지고 복수의 화소를 포함하여 영상을 표시한다. The display panel comprises a first substrate and a second substrate facing each other to display an image including a plurality of pixels. 광 센서들은 표시 패널에 구비되어 광을 센싱한다. Optical sensors are provided in the display panel to sense the light. 편광 필름은 제1 기판 또는 제2 기판 상에 제공되어 제1 방향으로 편광된 광을 투과시키고, 제1 방향과 실질적으로 직교하는 제2 방향으로 편광된 광을 흡수한다. Polarizing film absorbs light polarized in a second direction is provided on the first substrate or the second substrate and transmitted through the polarized light in a first direction, perpendicular to the first direction is substantially. 위상차 판은 편광 필름을 사이에 두고 표시 패널과 마주하여 구비되어, 상기 위상차 판을 두 번 통과하는 광의 편광방향을 90도 변경한다. A phase difference plate is interposed between a polarizing film is provided to face the display panel, and a polarization direction of light passing through the retarder twice changes by 90 degrees. 본 발명은 표시 장치에 관한 것으로, 더욱 상세하게는 외부 광의 센싱 능력을 향상시킨 표시 장치에 관한 것이다. The present invention relates to a display device, and more particularly, to a display device with improved external light sensing capabilities. 일반적으로 터치 패널은 표시 장치의 화면 상에 표시된 지시 내용을 사람의 손 또는 물체로 선택할 수 있는 것이다. In general, touch panel is where you can select the instructions displayed on the screen of the display device with hand or body of a person. 터치 패널을 갖는 표시 장치는 키보드, 마우스, 스캐너 등과 같은 별도의 입력 장치를 필요로 하지 않기 때문에 최근 사용이 증대되고 있다. Display device having a touch panel have been recently increased use because it does not require a separate input device such as keyboard, mouse, scanner. 터치 패널에 사용되는 센서는 표시 패널의 상측에 구비되는 경우와 표시 패널의 내부에 구비되는 경우가 있다. Sensors used in the touch panel is sometimes provided in the interior of the display panel when provided on the upper side of the display panel. 표시 패널의 상측 또는 내부에 구비되는 센서는 백라이트 유닛에서 제공된 가시광선 또는 적외선, 또는 표시 장치의 외부에서 제공된 광을 이용하여 외부 신호를 센싱한다. Sensors are provided on the upper side or the inside of the display panel by using light provided from the outside of the visible light or infrared, or a display device provided in the backlight unit to sense the external signal. 그런데, 센서로 적외선 영역의 광을 탐지하는 적외선 센서를 사용하는 경우, 적외선 센서에 적외선 영역의 광 이외의 다른 광이 탐지되는 경우가 발생한다. By the way, there is a case that when using an infrared sensor to detect light in the infrared region to the sensor, the other light other than the light in the infrared region to the infrared detection sensor occurs. 따라서, 본 발명의 목적은 외부 광의 센싱 능력을 향상시킨 표시 장치를 제공하는 것이다. Accordingly, it is an object of the present invention is to provide a display device with improved external light sensing capabilities. 본 발명의 일 실시예에 따른 표시 장치는 표시 패널, 복수의 광 센서, 편광 필름, 및 위상차 판을 포함한다. Display apparatus according to one embodiment of the present invention includes a display panel, a plurality of light sensors, a polarizing film, and a retardation plate. 상기 표시 패널은 서로 마주하는 제1 기판 및 제2 기판으로 이루어지고 복수의 화소를 포함하여 영상을 표시한다. The display panel comprises a first substrate and a second substrate facing each other to display an image including a plurality of pixels. 상기 광 센서들은 상기 표시 패널에 구비되어 광을 센싱한다. The light sensors are provided in the display panel to sense the light. 상기 편광 필름은 상기 제1 기판 또는 상기 제2 기판 상에 제공되어 제1 방향으로 편광된 광을 투과시키고, 상기 제1 방향과 실질적으로 직교하는 제2 방향으로 편광된 광을 흡수한다. The polarizing film absorbs light polarized in a second direction is provided on the first substrate or the second substrate passes through the polarized light in a first direction and substantially perpendicular to the first direction. 상기 위상차 판은 상기 편광 필름을 사이에 두고 상기 표시 패널과 마주하여 구비되어, 상기 위상차 판을 두 번 통과하는 광의 편광방향을 90도 변경한다. The phase difference plate is interposed between the polarizing film is provided to face the display panel, and a polarization direction of light passing through the retarder twice changes by 90 degrees. 이와 같은 표시 장치에 따르면, 위상차 판은 편광 필름을 통과하여 출사된 광의 편광 방향을 변경하여 다시 표시 패널로 입사되는 것을 방지한다. According to this display device, the retardation plate is prevented by changing the polarization direction of light emitted through the polarizing film again, which is incident to the display panel. 따라서, 광 센서들의 센싱 능력을 향상시킬 수 있다. Therefore, it is possible to improve the sensing ability of the photo sensor. 도 1은 본 발명의 일 실시예에 따른 표시 장치의 블럭도이다. Figure 1 is a block diagram of a display apparatus according to an embodiment of the present invention. 도 2는 도 1에 도시된 센서들의 회로도이다. 2 is a circuit diagram of the sensor shown in Fig. 도 3은 도 1의 표시 장치의 단면도이다. 3 is a cross-sectional view of the display device of FIG. 도 4는 도 3의 표시 패널의 확대 단면도이다. Figure 4 is an enlarged cross-sectional view of a display panel of FIG. 도 5는 도 4의 제2 기판, 제2 광학 필름, 및 보호 기판을 간략하게 도시한 본 발명의 일 실시예에 따른 단면도이다. 5 is a cross-sectional view according to an embodiment of the present invention briefly showing a second substrate, the second optical film, and a protective plate of FIG. 도 6은 적외선 필터를 투과한 광의 파장에 대한 투과 세기를 나타내는 도면이다. 6 is a view showing the transmission strength for the wavelength of the light that has passed through the infrared filter. 도 7은 도 4의 제2 기판, 광학 필름, 및 투명 기판을 간략하게 도시한 다른 실시예에 따른 단면도이다. 7 is a cross-sectional view according to another embodiment briefly shows the second substrate, an optical film, and the transparent substrate of Fig. 도 8b는 도 7의 위상차 판에서 광의 위상이 변경되는 과정을 설명하는 도면이다. Figure 8b is a view for explaining a process in which the phase of the light changes in the phase difference plate of Fig. 도 9는 도 4의 제2 기판, 제2 광학 필름, 및 보호 기판을 간략하게 도시한 또 다른 실시예에 따른 단면도이다. 9 is a cross-sectional view according to a second substrate, a second optical film, and a still another aspect briefly showing a protective plate of Example 4. 도 10은 도 4의 제2 기판, 제2 광학 필름, 및 보호 기판을 간략하게 도시한 또 다른 실시예에 따른 단면도이다. 10 is a cross-sectional view according to a second substrate, a second optical film, and a still another aspect briefly showing a protective plate of Example 4. 이하, 첨부한 도면들을 참조하여 본 발명의 바람직한 실시예를 보다 상세하게 설명한다. With reference to the accompanying drawings will be described in detail preferred embodiments of the invention. 도 1을 참조하면, 표시 장치(200)는 표시 패널(100), 타이밍 컨트롤러(130), 게이트 드라이버(140), 데이터 드라이버(150), 스캔 드라이버(160), 및 리드아웃 회로(170)를 포함한다. 1, the display 200 is a display panel 100, a timing controller 130, a gate driver 140, data driver 150, a scan driver 160, and a lead-out circuit 170 It includes. 상기 타이밍 컨트롤러(130)는 상기 표시 장치(200)의 외부 장치로부터 다수의 영상신호(RGB) 및 다수의 제어신호(CS)를 수신한다. The timing controller 130 receives a plurality of image signals (RGB) and a plurality of control signals (CS) from an external apparatus of the display device 200. 상기 타이밍 컨트롤러(130)는 상기 데이터 드라이버(150)와의 인터페이스 사양에 맞도록 상기 영상신호들(RGB)의 데이터 포맷을 변환하고, 변환된 영상신호들(R'G'B')을 상기 데이터 드라이버(150)로 제공한다. The timing controller 130 is to match the interface specifications between the data driver 150 converts the data format of the image signals (RGB), the transformed video signal (R'G'B ') the data driver providing (150). 또한, 상기 타이밍 컨트롤러(130)는 데이터 제어신호, 예를 들어, 출력개시신호(TP), 수평개시신호(STH) 및 극성반전신호(POL) 등을 상기 데이터 드라이버(150)로 제공하고, 게이트 제어신호, 예를 들어, 제1 개시신호(STV1), 제1 클럭신호(CK1), 및 제2 클럭신호(CKB1)를 게이트 드라이버(140)로 제공한다. In addition, the timing controller 130 provides data control signals, e.g., the output start signal (TP), a horizontal start signal (STH) and a polarity inversion signal (POL), etc. to the data driver 150, and the gate control signals, e.g., provides a first start signal (STV1), the first clock signal (CK1), and a second clock signal (CKB1) to the gate driver 140. 또한, 상기 타이밍 컨트롤러(130)는 스캔 제어신호, 예를 들어, 제2 개시신호(STV2), 제3 및 제4 클럭신호(CK2, CKB2)를 상기 스캔 드라이버(160)로 제공한다. Also provided by the timing controller 130 includes a scan control signal, for example, a second start signal (STV2), third and fourth clock signal (CK2, CKB2), the scan driver 160. 수신하여 상기 스캔 신호들(S1~Sn)을 순차적으로 출력한다. It receives and outputs the the scan signal (S1 ~ Sn) sequentially. 상기 스캔 제어신호(STV2, CK2, CKB2)는 게이트 제어신호(STV1, CK1, CKB1)에 동기하는 신호일 수 있다. The scan control signal (STV2, CK2, CKB2) may be a signal for synchronization with the gate control signal (STV1, CK1, CKB1). 상기 게이트 드라이버(140)는 상기 타이밍 컨트롤러(130)로부터 제공되는 상기 게이트 제어신호(STV1, CK1, CKB1)에 응답해서 게이트 신호들(G1~Gn)을 순차적으로 출력한다. The gate driver 140 outputs gate signals (G1 ~ Gn) in response to said gate control signal (STV1, CK1, CKB1) provided from the timing controller 130 sequentially. 상기 데이터 드라이버(150)는 상기 타이밍 컨트롤러(130)로부터 제공되는 상기 데이터 제어신호(TP, STH, POL)에 응답해서 상기 영상신호들(R'G'B')을 데이터 전압들(D1~Dm)로 변환하여 출력한다. The data driver 150 is the data control signal in response to the (TP, STH, POL) of said image signals (R'G'B '), a data voltage (D1 ~ Dm supplied from the timing controller 130, ) is converted to output to. 상기 출력된 데이터 전압들(D1~Dm)은 상기 표시 패널(100)로 인가된다. Of the output voltage data (D1 ~ Dm) is applied to the display panel 100. 상기 스캔 드라이버(160)는 상기 타이밍 컨트롤러(130)로부터 스캔 제어신호(STV2, CK2, CKB2)를 수신하여 상기 스캔 신호들(S1~Sn)을 순차적으로 출력한다. The scan driver 160 outputs a scan control signal (STV2, CK2, CKB2) the scanning signals (S1 ~ Sn) receives from the timing controller 130 sequentially. 상기 표시 패널(100)은 제1 기판(110), 상기 제1 기판(110)과 마주하는 제2 기판(120), 및 상기 제1 기판(110)과 상기 제2 기판(120) 사이에 개재된 액정층(미도시)으로 이루어진다. The display panel 100 is sandwiched between the first substrate 110, second substrate 120, and the first substrate 110 and the second substrate 120 facing the first substrate (110) a comprises a liquid crystal layer (not shown). 상기 제1 기판(110)에는 다수의 화소(PX)가 구비되고, 상기 제2 기판(120)에는 다수의 센서(SN)가 구비될 수 있다. The first substrate 110 is provided with a plurality of pixels (PX), the second substrate 120 has a plurality of sensors (SN) may be provided. 상기 화소들(PX) 각각은 서로 동일한 구조를 가지므로, 도 1에는 하나의 화소를 일 예로써 도시하였다. Since each of the pixels (PX) is the same structure to each other, in the Figure 1 it is shown by way of example be a pixel. 상기 제1 기판(110)에는 다수의 게이트 라인(GL1~GLn), 상기 게이트 라인들(GL1~GLn)과 교차하는 다수의 데이터 라인(DL1~DLm) 및 상기 화소들(PX)이 구비된다. The first substrate 110 is provided with a plurality of gate lines (GL1 ~ GLn), the gate lines (GL1 ~ GLn) and a plurality of data lines (DL1 ~ DLm) and the pixels that intersect (PX). 각 화소(PX)는 박막 트랜지스터(미도시) 및 화소 전극(미도시)을 포함한다. And each of the pixels (PX) comprises a thin film transistor (not shown) and pixel electrodes (not shown). 상기 박막 트랜지스터의 게이트 전극은 상기 게이트 라인들(GL1~GLn) 중 대응하는 게이트 라인에 연결되고, 소스 전극은 상기 데이터 라인들(DL1~DLm) 중 대응하는 데이터 라인에 연결되며, 드레인 전극은 상기 화소 전극에 연결된다. The gate electrode of the thin film transistor is connected to the gate lines corresponding to one of said gate lines (GL1 ~ GLn), the source electrode is connected to the data line corresponding one of the data lines (DL1 ~ DLm), the drain electrode is the It is connected to the pixel electrode. 상기 게이트 라인들(GL1~GLn)은 상기 게이트 드라이버(140)에 연결되며, 상기 데이터 라인들(DL1~DLm)은 상기 데이터 드라이버(150)에 연결된다. The gate lines (GL1 ~ GLn) is connected to the gate driver 140, the data lines (DL1 ~ DLm) are coupled to the data driver 150. 상기 게이트 라인들(GL1~GLn)은 상기 게이트 드라이버(140)로부터 제공되는 게이트 신호들(G1~Gn)을 수신하고, 상기 데이터 라인들(DL1~DLm)은 상기 데이터 드라이버(150)로부터 제공되는 데이터 전압들(D1~Dm)을 수신한다. The gate lines (GL1 ~ GLn) receives the gate signal (G1 ~ Gn) and the data lines (DL1 ~ DLm) provided by the gate driver 140 is provided from the data driver 150 It receives a data voltage (D1 ~ Dm). 따라서, 상기 각 화소(PX)의 박막 트랜지스터는 대응하는 게이트 라인으로 공급되는 게이트 신호에 응답하여 턴-온되고, 대응하는 데이터 라인으로 공급된 데이터 전압은 턴-온된 박막 트랜지스터를 통해 상기 화소 전극에 인가된다. Accordingly, the thin film transistors of the pixels (PX) is turned on in response to a gate signal supplied to the gate line corresponding-to the pixel electrode through the ondoen thin film transistor is turned on, the data voltage supplied to the data lines corresponding to the turn- It is applied. 한편, 상기 제2 기판(120)에는 상기 액정층을 사이에 두고 상기 화소 전극과 마주하는 기준 전극이 구비될 수 있다. On the other hand, the second substrate 120 may be a reference electrode facing the pixel electrode provided sandwiching the liquid crystal layer. 또한, 상기 제2 기판(120)에는 다수의 스캔 라인(SL1~SLi), 상기 스캔 라인들(SL1~SLi)과 교차하는 다수의 리드아웃 라인(RL1~RLj), 및 상기 다수의 센서(SN)가 구비된다. In addition, the second substrate 120 has a plurality of scan lines (SL1 ~ SLi), the scan lines (SL1 ~ SLi) and a plurality of lead-out lines (RL1 ~ RLj), and a plurality of sensors (SN said intersecting ) it is provided. 상기 다수의 스캔 라인(SL1~SLi)은 상기 스캔 드라이버(160)에 연결되어 다수의 스캔 신호(S1~Si)를 각각 순차적으로 수신한다. The plurality of scan lines (SL1 ~ SLi) are each received in sequence a plurality of scan signals (S1 ~ Si) is connected to the scan driver 160. 도 1에 도시되지 않았으나, 상기 표시 장치(200)는 상기 표시 패널(100)에 인접하게 구비되어 상기 표시 패널(100)로 광을 공급하는 백라이트 유닛을 더 포함한다. Although not shown in Figure 1, the display device 200 further includes a backlight unit for supplying light to the display panel 100 is provided adjacent to the display panel 100. 상기 백라이트 유닛에 관하여는 아래 첨부된 도 3을 참조하여 구체적으로 설명한다. Referring to Figure 3 the following are attached with respect to the backlight unit will be described in detail. 설명의 편의를 위해, 도 2에는 상기 스캔 라인들(SL1~SLi) 중 제1 및 제2 스캔 라인(SL1, SL2)을 도시하였고, 상기 리드아웃 라인들(RL1~RLj) 중 제1 내지 제4 리드아웃 라인(RL1, RL2, RL3, RL4)을 도시하였다. For ease of illustration, FIG. 2 or the first of was shown to the first and second scan lines (SL1, SL2) of the scan lines (SL1 ~ SLi), said lead-out lines (RL1 ~ RLj) the 4 is shown a lead-out line (RL1, RL2, RL3, RL4). 도 2를 참조하면, 상기 센서들(SN)은 적어도 두 종의 센서로 구분될 수 있다. Referring to Figure 2, each of the sensor (SN) may be separated by a sensor of at least two species. 예를 들어, 상기 센서들(SN)은 적외선 영역의 파장을 갖는 제1 광을 센싱하는 다수의 제1 센서(SN1) 및 가시광선 영역의 파장을 갖는 제2 광을 센싱하는 다수의 제2 센서(SN2)로 이루어질 수 있다. For example, the sensors (SN) has a plurality of second sensor for sensing a second light having a plurality of first sensor (SN1) and the wavelength of visible light for sensing a first light having a wavelength in the infrared region It may be made of a (SN2). 상기 제1 센서(SN1)들 각각은 제1 스위칭 트랜지스터(SWT1), 제1 센서 트랜지스터(IRT), 및 제1 커패시터(CS1)를 포함한다. Each of the first sensor (SN1) comprises a first switching transistor (SWT1), the first sensor transistor (IRT), and a first capacitor (CS1). 상기 제1 스위칭 트랜지스터(SWT1)의 게이트 전극은 상기 스캔 라인들(SL1~SLi) 중 대응하는 스캔 라인에 연결되고, 소스 전극은 상기 리드아웃 라인들(RL1~RLj) 중 대응하는 리드아웃 라인에 연결되며, 드레인 전극은 상기 제1 커패시터(CS1)와 상기 제1 센서 트랜지스터(IRT)에 연결된다. A gate electrode of the first switching transistor (SWT1) is connected to the scan lines corresponding one of the scan lines (SL1 ~ SLi), the source electrode is the lead-out lines a corresponding one of the lead-out lines (RL1 ~ RLj) is connected, the drain electrode is connected to said first capacitor (CS1) of the first sensor transistor (IRT). 상기 제1 커패시터(CS1)의 제1 전극은 상기 제1 스위칭 트랜지스터(SWT1)의 드레인 전극에 연결되고, 제2 전극에는 제1 바이어스 전압(VB1)이 인가된다. The first electrode of the first capacitor (CS1) is connected to the drain electrode of the first switching transistor (SWT1), the second electrode is applied with a first bias voltage (VB1). 예를 들어, 상기 제1 바이어스 전압(VB1)은 -4V일 수 있다. For example, the first bias voltage (VB1) may be -4V. 상기 제1 센서 트랜지스터(IRT)의 게이트 전극에는 제2 바이어스 전압(VB2)이 인가되고, 소스 전극은 상기 제1 스위칭 트랜지스터(SWT1)의 드레인 전극에 연결되며, 드레인 전극에는 상기 제1 바이어스 전압(VB1)이 인가된다. Said first sensor gate electrode of the transistor (IRT) is applied to the second bias voltage (VB2), the source electrode is connected to the drain electrode of the first switching transistor (SWT1), the drain electrode, the first bias voltage ( VB1) is applied. 상기 제2 바이어스 전압(VB2)은 상기 제1 바이어스 전압(VB1)보다 작은 전압 레벨을 갖는다. It said second bias voltage (VB2) has a voltage level greater than the first bias voltage (VB1). 예를 들어, 상기 제2 바이어스 전압(VB2)은 -9V일 수 있다. For example, the second bias voltage (VB2) may be -9V. 상기 제1 센서 트랜지스터(IRT)는 외부로부터 입사되는 상기 제1 광의 광량에 대응하는 포토 커런트를 생성한다. The first sensor transistor (IRT) generates a photo current corresponding to the first amount of light that is incident from the outside. 한편, 상기 제2 센서(SN2)들 각각은 제2 스위칭 트랜지스터(SWT2), 제2 센서 트랜지스터(VST), 및 제2 커패시터(CS2)를 포함한다. On the other hand, each of the second sensor (SN2) is a second switching transistor (SWT2), the second sensor transistor (VST), and a second capacitor (CS2). 상기 제2 스위칭 트랜지스터(SWT2)의 게이트 전극은 상기 스캔 라인들(SL1~SLi) 중 대응하는 스캔 라인에 연결되고, 소스 전극은 상기 리드아웃 라인들(RL1~RLj) 중 대응하는 리드아웃 라인에 연결되며, 드레인 전극은 상기 제2 커패시터(CS2)와 상기 제2 센서 트랜지스터(VST)에 연결된다. A gate electrode of the second switching transistor (SWT2) is connected to the scan lines corresponding one of the scan lines (SL1 ~ SLi), the source electrode is the lead-out lines a corresponding one of the lead-out lines (RL1 ~ RLj) is connected, the drain electrode is connected to the second capacitor (CS2) and the second sensor transistor (VST). 상기 제2 커패시터(CS2)의 제1 전극은 상기 제2 스위칭 트랜지스터(SWT2)의 드레인 전극에 연결되고, 제2 전극에는 상기 제1 바이어스 전압(VB1)이 인가된다. A first electrode of the second capacitor (CS2) is connected to the drain electrode of the second switching transistor (SWT2), a second electrode, the first bias voltage (VB1) is applied. 상기 제2 센서 트랜지스터(VST)의 게이트 전극에는 상기 제2 바이어스 전압(VB2)이 인가되고, 소스 전극은 상기 제2 스위칭 트랜지스터(SWT2)의 드레인 전극에 연결되며, 드레인 전극에는 상기 제1 바이어스 전압(VB1)이 인가된다. Said second sensor gate electrode of the transistor (VST) is applied with the second bias voltage (VB2) and the source electrode is connected to the drain electrode of the second switching transistor (SWT2), the drain electrode, the first bias voltage It is applied (VB1). 상기 제2 센서 트랜지스터(VST)는 외부로부터 입사되는 상기 제2 광의 광량에 대응하는 포토 커런트를 생성한다. The second sensor transistor (VST) generates a photo current corresponding to the second amount of light that is incident from the outside. 도 2를 참고하면, 상기 제1 및 제2 센서들(SN1, SN2)은 상기 스캔 라인들(SL1~SLi)이 연장된 제1 방향으로 교번적으로 배열되고, 상기 리드아웃 라인들(RL1~RLj)이 연장된 제2 방향으로 교번적으로 배열된다. S Referring to FIG. 2, the first and second sensors (SN1, SN2) are arranged alternately in a first direction, a is the scan lines (SL1 ~ SLi) extending small, the read-out line (RL1 ~ RLj) are arranged alternately in the second direction is extended. 구체적으로, 본 발명의 일 예로, 상기 리드아웃 라인들(RL1~RLj) 중 4k-3번째(여기서, k는 1 이상의 자연수) 리드아웃 라인, 예를 들어, 도 2에서 제1 리드아웃 라인(RL1) 및 4k번째 라인, 예를 들어, 도 2에서 제4 리드아웃 라인(RL4)에는 상기 제1 센서들(SN1)이 연결된다. Specifically, one example of the present invention, the lead-out lines (RL1 ~ RLj) of 4k-3-th (where, k is a natural number of 1 or more), the lead-out line, for example, the first lead-out line in Figure 2 ( RL1) and for 4k th line, for example, there is the first of the first sensor (SN1) is connected to the fourth lead-out line (RL4) in Fig. 또한, 상기 리드아웃 라인들(RL1~RLj) 중 4k-2번째 리드아웃 라인, 예를 들어, 도 2에서 제2 리드아웃 라인(RL2) 및 4k-1번째 라인, 예를 들어, 도 2에서 제3 리드아웃 라인(RL3)에는 상기 제2 센서들(SN2)이 연결된다. In addition, the lead-out lines (RL1 ~ RLj) of 4k-2 second lead-out line, for example, in Figure 2, the second lead-out line (RL2), and 4k-1-th line, for example, in Figure 2 the third lead-out line (RL3), the s (SN2) and the second sensor is connected. 상기 제1 및 제2 센서(SN1, SN2)들 각각은 대응하는 스캔라인으로 공급되는 스캔신호에 응답하여 상기 제1 및 제2 스위칭 트랜지스터(SWT1, SWT2)가 턴-온되면, 상기 제1 및 제2 커패시터(CS1, CS2)에 충전된 전하를 상기 턴-온된 스위칭 트랜지스터(SWT1, SWT2)를 통해 상기 대응하는 리드아웃 라인으로 제공한다. Said first and second sensor (SN1, SN2), respectively in response to the scan signal supplied to the scan lines corresponding to the first and second switching transistors (SWT1, SWT2) is turned on, the first and the ondoen through the switching transistor (SWT1, SWT2) provided in the lead-out line to the corresponding - a second capacitor to turn the electric charge charged in the (CS1, CS2). 상기 리드아웃 회로(170)는 상기 타이밍 컨트롤러(130)로부터 공급되는 리드아웃 제어신호(RCS)에 응답하여 상기 리드아웃 라인들(RL1~RLj)로부터 수신된 전압들(SS)을 순차적으로 상기 타이밍 컨트롤러(130)로 제공한다. The readout circuit 170 is the timing of the voltage of the (SS) received from the read-out lines (RL1 ~ RLj) in response to a readout control signal (RCS) supplied from the timing controller 130 sequentially and it provides the controller 130. 상기 타이밍 컨트롤러(130)는 상기 스캔 신호가 발생된 시점 및 상기 리드아웃 회로(170)로부터 수신된 전압(SS)을 근거로 화면에서 터치된 지점 또는 스캔될 대상에 대한 정보들의 2차원 좌표값을 생성할 수 있다. The timing controller 130 is a two-dimensional coordinate values ​​of the information on the destination to be a point or scanning the touch screen on the basis of the voltage (SS) received from a point in time and the readout circuit 170 to which the scan signal is generated It can be generated. 구체적으로, 외부로부터 입사된 광, 즉 외부 물체에 의해 반사되어 상기 제1 및 제2 센서(SN1, SN2)에 입사된 광을 상기 제1 및 제2 센서(SN1, SN2)가 센싱하고, 상기 리드아웃 회로(170)에서 센싱된 광의 세기에 대응하는 신호를 측정하는 방법은 다음과 같다. Specifically, the incident external light, that is reflected by an external object, wherein the first and second sensor (SN1, SN2) of the first and second sensor (SN1, SN2) to the light incident on the sensing, wherein the method of measuring the signal corresponding to the intensity of the light sensed in the readout circuit 170 is as follows. 먼저, 상기 리드아웃 회로(170)는 소정의 전압, 예를 들어 1V의 전압을 상기 리드아웃 라인들(RL1~RLj)로 인가한다. First, the readout circuit 170 is applied to a predetermined voltage, for example, the voltage of 1V to the lead-out lines (RL1 ~ RLj). 상기 스캔 라인들(SL1~SLi)에 상기 제1 및 제2 스위칭 트랜지스터(SWT1, SWT2)를 턴-온하는 게이트-온 신호가 인가되면, 상기 제1 및 제2 스위칭 트랜지스터(SWT1, SWT2)는 상기 리드아웃 회로(170)로부터 수신한 1V 전압을 상기 제1 및 제2 커패시터(Cs1, Cs2)로 출력한다. Wherein the scan lines (SL1 ~ SLi) of the first and second switching transistors (SWT1, SWT2) to turn on the gate of the on-when applied to the on signal, the first and second switching transistors (SWT1, SWT2) is and outputs a 1V voltage received from the readout circuit 170 to the first and second capacitors (Cs1, Cs2). 따라서, 상기 제1 및 제2 스위칭 트랜지스터(SWT1, SWT2)와 연결된 상기 제1 및 제2 커패시터(Cs1, Cs2) 각각의 제1 전극에는 1V 전압이 인가되고, 제2 전극에는 상기 제1 바이어스 전압(VB1), 예를 들어 -4V의 전압이 인가되어, 상기 제1 및 제2 커패시터(Cs1, Cs2) 각각에는 5V의 전압이 인가된다. Thus, the first and second respective first electrode switching transistor (SWT1, SWT2) and the first and second capacitors (Cs1, Cs2) is connected, and applying a 1V voltage, a second electrode, the first bias voltage (VB1), for example, is applied the voltage of -4V, has the first and second capacitors (Cs1, Cs2) are respectively applied with a voltage of 5V. 만약 외부로부터 입사된 광이 상기 제1 및 제2 센서 트랜지스터(IRT, VST)로 입사되지 않으면, 상기 제1 및 제2 센서 트랜지스터(IRT, VST)는 턴-오프되어 상기 제1 및 제2 커패시터(Cs1, Cs2) 각각의 상기 제1 전극은 1V로 유지된다. If the light incident from the outside is incident to the first and the second sensor transistor (IRT, VST), the first and the second sensor transistor (IRT, VST) is turned on, it turned off said first and second capacitors each of the first electrodes (Cs1, Cs2) is held at 1V. 상기 스캔 라인들(SL1~SLi)에 다음 게이트-온 신호가 입력되어 상기 제1 및 제2 스위칭 트랜지스터(SWT1, SWT2)가 턴-온 되더라도 상기 제1 및 제2 커패시터(Cs1, Cs2) 각각의 상기 제1 전극과 상기 리드아웃 회로(170) 간에 전압차가 발생하지 않아, 상기 리드아웃 라인들(RL1~RLj)을 통하여 상기 리드아웃 회로(170)로 전류가 흐르지 않는다. To the scan lines (SL1 ~ SLi), and then the gate-to-on signal is input to the first and second switching transistors (SWT1, SWT2) is turned on each even one of the first and second capacitors (Cs1, Cs2) voltage difference is not generated between the first electrode and the lead-out circuit 170, but the current in the readout circuit 170 to flow through the lead-out lines (RL1 ~ RLj). 만약 외부로부터 입사된 광이 상기 제1 및 제2 센서 트랜지스터(IRT, VST)로 입사되면, 상기 제1 및 제2 센서 트랜지스터(IRT, VST)는 턴-온 되고, 상기 턴-온된 센서 트랜지스터를 통하여 상기 제1 및 제2 커패시터(Cs1, Cs2) 각각의 상기 제1 전극에서부터 상기 제1 및 제2 센서 트랜지스터(IRT, VST)를 통하여 전하가 이동한다. If the light incident from the outside is incident to the first and the second sensor transistor (IRT, VST), the first and the second sensor transistor (IRT, VST) is turned on, the turn-to ondoen sensor transistor through the first and second capacitors (Cs1, Cs2), from each of the first electrode of the charge transfer through the first and the second sensor transistor (IRT, VST). 따라서, 상기 제1 및 제2 커패시터(Cs1, Cs2)의 상기 제1 전극의 전압은 변할 수 있다. Thus, the first and the voltage of the first electrode of the second capacitor (Cs1, Cs2) can be varied. 상기 제1 및 제2 커패시터(Cs1, Cs2) 각각의 상기 제1 전극의 전압이 예를 들어, 0.5V로 변한 때, 상기 스캔 라인들(SL1~SLi)에 다음 게이트-온 신호가 입력되어 상기 제1 및 제2 스위칭 트랜지스터(SWT1, SWT2)가 턴-온 되면, 상기 제1 및 제2 커패시터(Cs1, Cs2)의 상기 제1 전극과 상기 리드아웃 회로(170) 간에 0.5V의 전압차가 발생하여, 상기 리드아웃 라인들(RL1~RLj)을 통하여 전하의 흐름이 발생한다. The first and second capacitors (Cs1, Cs2), for each of the voltage of the first electrode, for example, when changed to 0.5V, to the scan lines (SL1 ~ SLi), and then the gate-on signal has been input the first and second switching transistors (SWT1, SWT2) is turned on, the first and second capacitor wherein the voltage difference of 0.5V occurs between the first electrode and the lead-out circuit 170 of the (Cs1, Cs2) and, the flow of the charge generation through the lead-out lines (RL1 ~ RLj). 상기 리드아웃 회로(170)는 상기 전하의 흐름에 따라 전달된 전하를 충전하는 적분기(미도시)를 포함할 수 있고, 상기 적분기에 충전된 전하량에 대응하는 전압으로 상기 제1 및 제2 센서(SN1, SN2)에 입사된 광의 세기의 정도를 측정한다. The readout circuit 170 may include an integrator (not shown) to charge the charge transfer along the flow of the said charge, the first and second sensors into a voltage corresponding to the charge amount charged in the integrator ( the degree of the intensity of light incident on SN1, SN2) is measured. 상기 제1 및 제2 센서 트랜지스터(IRT, VST)로 입사된 광의 세기가 클수록, 상기 제1 및 제2 커패시터(Cs1, Cs2) 각각의 상기 제1 전극의 전압은 더 크게 변하고, 상기 제1 및 제2 커패시터(Cs1, Cs2) 각각의 상기 제1 전극과 상기 리드아웃 회로(170) 간의 전압차도 더 커져, 상기 리드아웃 라인들(RL1~RLj)을 통해 더 큰 전류가 흐른다. It said first and second sensor transistor the greater the intensity of the light incident on the (IRT, VST), the first and second capacitors (Cs1, Cs2), each of the voltage of the first electrode is changed more largely, the first and a second capacitor (Cs1, Cs2) flows a larger current through the voltage driveway further increased, the lead-out lines (RL1 ~ RLj) between each of the first electrode and the lead-out circuit 170. 따라서, 상기 리드아웃 회로(170)는 상기 제1 및 제2 센서 트랜지스터(IRT, VST)로 입사된 광의 세기에 따라 다른 레벨의 전압을 측정할 수 있다. Thus, the readout circuit 170 may measure the different levels of voltage according to the intensity of light incident to the first and the second sensor transistor (IRT, VST). 상기 리드아웃 회로(170)는 상기 타이밍 컨트롤러(160)로부터 공급되는 리드아웃 제어신호(RCS)에 응답하여 상기 리드아웃 라인들(RL1~RLj)을 통하여 수신된 센싱 전류들(R1~Rj)을 이용하여 상기 적분기에 전하를 충전한다. The readout circuit 170 is the timing controller in response to a readout control signal (RCS) supplied from the 160, the lead-out lines (RL1 ~ RLj), a sensing electric current received via a (R1 ~ Rj) used to charge the electric charge to the integrator. 이후, 상기 리드아웃 회로(170)는 상기 적분기에 충전된 전하량에 대응하는 전압들(SS)을 상기 타이밍 컨트롤러(130)로 순차적으로 제공한다. Thereafter, the readout circuit 170 provides a voltage of (SS) to the timing controller 130 corresponding to the amount of charge charged to the integrator in order. 도 3을 참조하면, 표시 장치(200)는 영상을 표시하는 표시 패널(100) 및 상기 표시 패널(100)의 하부에 구비된 백라이트 유닛(250)을 포함한다. 3, the display device 200 includes a backlight unit 250 provided in the lower portion of the display panel 100 and the display panel 100 for displaying an image. 상기 백라이트 유닛(250)은 상기 표시 패널(100)의 하부에 배치된 회로기판(201), 상기 회로기판(201) 상에 실장되어 적외선 영역의 파장을 갖는 제1 광을 출사하는 다수의 제1 광원(210), 및 상기 회로기판(201) 상에 실장되어 가시광선 영역의 파장을 갖는 다수의 제2 광원(220)을 포함한다. The backlight unit 250 includes a first plurality of which is mounted on a circuit board 201, the circuit board 201 is disposed under the display panel 100 is emitting a first light having a wavelength in the infrared region includes a light source 210, and a plurality of second light sources 220 are mounted on the circuit board 201 having a wavelength in the visible light region. 본 발명의 일 예로, 상기 제1 및 제2 광원들(210, 220)은 서로 교번적으로 배치될 수 있다. In one embodiment of the present invention, the first and second light sources 210 and 220 can be arranged in one another alternately. 구체적으로, 도 3에 도시된 바와 같이 서로 인접하는 두 개의 제1 광원(210) 사이에 하나 이상의 제2 광원(220)이 배치될 수 있다. Specifically, there may be disposed the first two at least one second light source (220) between the first light source 210 that are adjacent to each other as shown in Fig. 또한, 상기 제1 및 제2 광원들(210, 220) 각각은 발광 다이오드로 이루어질 수 있다. In addition, the first and second light sources 210 and 220 each may be formed of a light-emitting diode. 상기 제1 광원들(210)로부터 출사된 상기 제1 광은 상기 표시 패널(100)로 입사된 후 상기 표시 패널(100)을 통과한다. The first light emitted from the second to the first light source 210 passes through the display panel 100 after being incident to the display panel 100. 상기 표시 패널(100)을 통과한 상기 제1 광은 사용자의 눈에는 인식되지 않으므로, 상기 사용자가 상기 표시 패널(100)에 표시된 영상을 인식하는 데에는 영향을 미치지 않는다. The display panel 100 by the first light is not recognized, the user's eye through the, it does not affect There for the user to recognize the image displayed on the display panel 100. 상기 제1 광원들(210)로부터 출사된 상기 제1 광은 상기 표시 패널(100) 내에 구비된 다수의 층에 의해서 일부 반사되고, 일부만이 상기 표시 패널(100)을 통과할 수 있다. The first light emitted from the second to the first light source 210 is partially reflected by a plurality of layers provided in the display panel 100, only some of which may pass through the display panel 100. 상기 표시 패널(100)을 통과한 제1 광은 외부로 방사되지만, 상기 표시 패널(100) 상에 물체, 예를 들어, 손가락이 존재하면, 상기 손가락에 의해서 반사될 수 있다. The display panel of claim passed through the 100 in the first light, but emitted to the outside, the display panel containing the objects, for example, on a (100), when a finger is present, may be reflected by the finger. 이로써, 상기 반사된 제1 광은 상기 표시 패널(100) 측으로 재입사되어 상기 제1 센서 트랜지스터(IRT)를 통해 센싱될 수 있다. Thus, the first reflected light is re-incident toward the display panel 100 may be sensed by the first sensor transistor (IRT). 도 4를 참조하면, 상기 표시 패널(100)은 제1 기판(110), 상기 제1 기판(110)과 마주하는 제2 기판(120), 및 상기 제1 기판(110)과 상기 제2 기판(120) 사이에 개재된 액정층(LC)을 포함한다. 4, the display panel 100 includes a first substrate 110, the first substrate 110, second substrate 120, and the first substrate 110 facing the second substrate 120, a liquid crystal layer (LC) interposed between. 상기 제1 기판(110)은 제1 베이스 기판(111), 및 상기 제1 베이스 기판(111) 상에 구비된 다수의 화소(PX1~PX6)를 포함한다. The first substrate 110 includes a plurality of pixels (PX1 ~ PX6) that is provided on the first base substrate 111, and the first base substrate 111. 상기 화소들(PX1~PX6) 각각은 박막 트랜지스터(Tr) 및 화소 전극(115)을 포함한다. Each of the pixels (PX1 ~ PX6) comprises a thin film transistor (Tr) and a pixel electrode 115. 도 4에서는 제1 방향으로 배열된 6개의 화소(PX1~PX6)를 예로써 도시하였다. In Figure 4 it is shown the six pixels (PX1 ~ PX6) arranged in the first direction, for example. 상기 6개의 화소(PX1~PX6) 각각은 서로 동일한 구조를 가지므로, 하나의 화소를 예로써 설명한다. Since the six pixels (PX1 ~ PX6) each have the same structure each other, it will be described one pixel, for example. 상기 제1 베이스 기판(111) 상에는 상기 박막 트랜지스터(Tr)의 게이트 전극(GE1)이 형성된다. A gate electrode (GE1) of the thin film transistor (Tr) is formed on the first base substrate 111. 상기 게이트 전극(GE1)은 제1 게이트 절연막(112)에 의해서 커버된다. The gate electrode (GE1) is covered by the first gate insulating film 112. 상기 제1 게이트 절연막(112) 상에는 상기 게이트 전극(GE1)과 마주하도록 액티브층(ACT1) 및 오믹 콘택층(ACT2)이 형성된다. The active layer (ACT1) and the ohmic contact layer (ACT2) formed on the first gate insulating film 112 so as to face the gate electrode (GE1) is formed. 이후, 상기 액티브층(ACT1) 상부에서 서로 소정 간격으로 이격된 소오스 및 드레인 전극(SE1, DE1)이 형성된다. Thereafter, the active layer (ACT1) the source and drain electrodes (SE1, DE1) spaced a predetermined distance from each other at the top is formed. 상기 소오스 및 드레인 전극(SE1, DE1)은 제1 보호막(113)에 의해서 커버되고, 상기 제1 보호막(113) 상에는 유기 절연막(114)이 더 형성된다. The source and drain electrodes (SE1, DE1) is covered by the first protective film 113, the first organic insulating layer 114 is formed on the first protective film 113 is further formed. 상기 제1 보호막(113) 및 유기 절연막(114)에는 상기 드레인 전극(DE1)을 노출시키는 콘택홀(114a)이 형된다. The first protective film 113 and the organic insulation film 114 has a contact hole (114a) exposing the drain electrode (DE1) is shaped. 상기 화소 전극(115)은 상기 유기 절연막(114) 상에 형성되고, 상기 콘택홀(114a)을 통해 상기 드레인 전극(DE1)과 전기적으로 연결된다. The pixel electrode 115 is formed on the organic insulating layer 114, and is electrically connected to the drain electrode (DE1) through the contact hole (114a). 상기 제2 기판(120)은 제2 베이스 기판(121), 상기 제2 베이스 기판(121) 상에 형성된 다수의 센서(SN1, SN2) 및 상기 다수의 화소들(PX)과 각각 대응하여 구비되는 다수의 색화소(R, G, B)를 포함하는 컬러필터층(125) 및 기준 전극(127)을 포함한다. The second substrate 120 of the second base substrate 121, the second plurality of sensors (SN1, SN2) and a plurality of pixels so formed on a base substrate 121 (PX), and provided to correspond includes a color filter layer 125 and reference electrode 127 which includes a plurality of color pixels (R, G, B). 상기 제2 베이스 기판(121) 상에는 상기 다수의 센서(SN1, SN2)가 형성된다. The second base substrate 121 formed on the plurality of sensor (SN1, SN2) is formed. 상기 센서들(SN1, SN2)은 제1 센서(SN1) 및 제2 센서(SN2)로 구분된다. Said sensor (SN1, SN2) is divided into a first sensor (SN1) and the second sensor (SN2). 상기 제1 센서(SN1)는 제1 스위칭 트랜지스터(SWT), 제1 커패시터(CS1), 및 제1 센서 트랜지스터(IRT)를 포함한다. And the first sensor (SN1) comprises a first switching transistor (SWT), a first capacitor (CS1), and a first sensor transistor (IRT). 상기 제2 센서(SN2)는 제2 스위칭 트랜지스터(SWT2), 제2 커패시터(CS1) 및 제2 센서 트랜지스터(VST)를 포함한다. And the second sensor (SN2) is a second switching transistor (SWT2), a second capacitor (CS1) and the second sensor transistor (VST). 상기 제1 및 제2 센서(SN1, SN2)는 유사한 구조로 이루어지므로, 동일한 공정을 통해 동시에 형성될 수 있다. It made on a first and a second sensor (SN1, SN2) has a similar structure, through the same process can be formed at the same time. 구체적으로, 상기 제2 베이스 기판(121) 상에는 상기 제1 및 제2 스위칭 트랜지스터(SWT1, SWT2)의 게이트 전극(GE2, GE3)이 형성된다. Specifically, the gate electrode (GE2, GE3) of the first and second switching transistors (SWT1, SWT2) formed on the second base substrate 121 is formed. 상기 제1 및 제2 스위칭 트랜지스터(SWT1, SWT2)의 게이트 전극(GE2, GE3) 상에는 제2 게이트 절연막(122)이 형성된다. A second gate insulating film 122 is formed on the gate electrode (GE2, GE3) of the first and second switching transistors (SWT1, SWT2) is formed. 상기 제2 게이트 절연막(122) 상에는 상기 제1 스위칭 트랜지스터(SWT1)의 반도체층(SEM1) 및 상기 제2 스위칭 트랜지스터(SWT2)의 반도체층(SEM2)이 형성된다. On the second gate insulating film 122, a semiconductor layer (SEM2) of the first switching transistor (SWT1) semiconductor layer (SEM1) and the second switching transistor (SWT2) it is formed of. 상기 제2 게이트 절연막(122) 상에는 상기 제1 센서 트랜지스터(IRT)의 제1 광 센싱층(LSE1) 및 상기 제2 센서 트랜지스터(VST)의 제2 광 센싱층(LSE2)이 형성된다. The second light-sensing layer (LSE2) formed on the second gate insulating film 122, the first sensor transistor (IRT) first optical sensing layer (LSE1) and the second sensor transistor (VST) of are formed. 상기 제1 광 센싱층(LSE1)은 적외선 영역의 파장을 갖는 상기 제1 광에 반응하는 실리콘 게르마늄(SiGe)으로 이루어질 수 있고, 상기 제2 광 센싱층(LSE2)은 가시광선 영역의 파장을 갖는 상기 제2 광에 반응하는 아몰퍼스 실리콘(a-Si)으로 이루어질 수 있다. The first light sensing layer (LSE1) can be made of a silicon germanium (SiGe) responsive to the first light having a wavelength in the infrared region, wherein the second photo-sensing layer (LSE2) is a wavelength of visible light the second may be formed of amorphous silicon (a-Si) in response to a second light. 상기 제2 기판(120)은 상기 제2 광은 차단하고, 상기 제1 광만을 투과시키는 적외선 필터(128)를 더 구비할 수 있다. The second substrate 120 and the second light may be blocked, and further comprising an infrared filter 128 that transmits only light of the first. 상기 적외선 필터(128)는 상기 제1 광 센싱층(LSE1)에 대응하여 상기 제2 베이스 기판(121)과 상기 제2 게이트 절연막(122) 사이에 구비될 수 있다. The infrared filter 128 may be provided between the first photo-sensing layer in response to the (LSE1) the second base substrate 121 and the second gate insulating film 122. 본 발명의 일 예로, 상기 적외선 필터(128)는 실리콘 게르마늄(SiGe)으로 이루어질 수 있다. In one embodiment of the present invention, the infrared filter 128 may be formed of silicon germanium (SiGe). 상기 제1 스위칭 트랜지스터(SWT1)의 상기 반도체층(SEM1) 상부에서 서로 소정 간격으로 이격된 소스 및 드레인 전극(SE2, DE2)이 형성되고, 상기 제2 스위칭 트랜지스터(SWT2)의 상기 반도체층(SEM2) 상부에서 서로 소정 간격으로 이격된 소스 및 드레인 전극(SE3, DE3)이 형성된다. Wherein the semiconductor layer of the first switching transistor (SWT1) the semiconductor layer (SEM1) with each other at the top spaced a predetermined distance source and drain electrodes (SE2, DE2) it is formed, and the second switching transistor (SWT2) of (SEM2 ) are each formed at the top of the source and drain electrodes (SE3, DE3) spaced at a predetermined interval. 한편, 상기 제1 센서 트랜지스터(IRT)의 상기 제1 광 센싱층(LSE1) 상부에는 서로 소정 간격으로 이격된 소스 및 드레인 전극(SE4, DE4)이 형성되고, 상기 제2 센서 트랜지스터(VST)의 상기 제2 광 센싱층(LSE2) 상부에서 서로 소정 간격으로 이격된 소스 및 드레인 전극(SE5, DE5)이 형성된다. On the other hand, of the first sensor transistor (IRT) of the first optical sensing layer (LSE1) upper part and with each other to form the source and drain electrodes (SE4, DE4) spaced at a predetermined interval, the second sensor transistor (VST) of wherein the second photo-sensing layer (LSE2) from each other spaced a predetermined interval from the upper source and drain electrodes (SE5, DE5) are formed. 여기서, 상기 제1 센서 트랜지스터(IRT)의 소스 전극(SE4)은 상기 제1 스위칭 트랜지스터(SWT1)의 드레인 전극(DE2)과 전기적으로 연결되며, 상기 제1 커패시터(CS1)의 제1 전극으로 기능할 수 있다. Here, the first sensor source electrode (SE4) of the transistor (IRT) is electrically connected to the drain electrode (DE2) of the first switching transistor (SWT1), functions as a first electrode of the first capacitor (CS1) can do. 또한, 상기 제2 센서 트랜지스터(VST)의 소스 전극(SE5)은 상기 제2 스위칭 트랜지스터(SWT2)의 드레인 전극(DE3)과 전기적으로 연결되며, 상기 제2 커패시터(CS2)의 제1 전극으로 기능할 수 있다. In addition, the second sensor source electrodes (SE5) of the transistor (VST) is connected to the second drain electrode (DE3) and electrical switching transistor (SWT2), functions as a first electrode of the second capacitor (CS2) can do. 상기 제1 스위칭 트랜지스터(SWT1)의 소스 및 드레인 전극(SE2, DE2), 상기 제2 스위칭 트랜지스터(SWT2)의 소스 및 드레인 전극(SE3, DE3), 상기 제1 센서 트랜지스터(IRT)의 소스 및 드레인 전극(SE4, DE4), 및 상기 제2 센서 트랜지스터(VST)의 소스 및 드레인 전극(SE5, DE5)은 제2 보호막(123)에 의해서 커버된다. The first source and drain electrodes (SE2, DE2) of the switching transistor (SWT1), the second source and drain electrodes (SE3, DE3) of the switching transistor (SWT2), source and drain of the first sensor transistor (IRT) electrode (SE4, DE4), and the second sensor transistor source and drain electrodes (SE5, DE5) of (VST) is covered by the second protective film 123. 상기 제2 보호막(123) 상에는 상기 제1 센서 트랜지스터(IRT)의 게이트 전극(이하, 제1 탑 게이트라 한다)(TGE1)이 형성되고, 상기 제2 센서 트랜지스터(VST)의 게이트 전극(이하, 제2 탑 게이트라 한다)(TGE2)이 형성된다. The second protective film 123 is formed on the first sensor (hereinafter referred to as a first top gate), the gate electrode of the transistor (IRT) (TGE1) is formed, and the second gate electrode of the sensor transistor (VST) (hereinafter, the second is called the top-gate) (TGE2) is formed. 또한, 상기 제2 보호막(123) 상에는 상기 제1 커패시터(CS1)의 제2 전극 및 상기 제2 커패시터(CS2)의 제2 전극이 형성된다. In addition, the second electrode of the second electrode and the second capacitor (CS2) of said first capacitor (CS1) formed on the second protective film 123 is formed. 본 발명의 일 예로, 상기 제1 스위칭 트랜지스터(SWT1)는 상기 제2 보호막(123) 상에 구비되고 상기 게이트 전극(GE2)과 전기적으로 연결된 더미 게이트 전극(TGE3)을 더 포함할 수 있다. An example of the invention, the first switching transistor (SWT1) may further include a dummy gate electrode (TGE3) is connected is provided on the second protection film 123 to the gate electrode (GE2) and electrically. 또한, 상기 제2 스위칭 트랜지스터(SWT2)는 상기 제2 보호막(123) 상에 구비되고, 상기 게이트 전극(GE3)과 전기적으로 연결된 더미 게이트 전극(TGE4)을 더 포함할 수 있다. Further, the second switching transistor (SWT2) may further include a second protective film is provided on the (123), said gate electrode (GE3) and electrically dummy gate electrode (TGE4) connected. 또한, 도 4에 도시된 바와 같이, 상기 제1 센서 트랜지스터(IRT)의 상기 제1 탑 게이트(TGE1)는 상기 적외선 필터(128)와 전기적으로 연결될 수 있다. Further, the first top gate (TGE1) of the first sensor transistor (IRT) as shown in Figure 4 may be electrically connected with the infrared filter 128. 구체적으로, 상기 적외선 필터(128) 상에는 상기 제1 스위칭 트랜지스터(SWT1)의 게이트 전극(GE2)과 동일한 공정을 통해서 연결 전극(CE)이 구비될 수 있다. Specifically, the connection electrode (CE) by the same process as the gate electrode (GE2) of the first switching transistor (SWT1) on said infrared filter 128 may be provided. 상기 제2 게이트 절연막(122) 및 상기 제2 보호막(123)에는 상기 연결 전극(CE)을 노출시키기 위한 제2 콘택홀(123a)이 형성되고, 상기 제1 탑 게이트(TGE1)는 상기 제2 콘택홀(123a)을 통해 상기 연결 전극(CE)에 전기적으로 연결될 수 있다. The second gate insulating film 122 and the second protective film 123, the second contact hole (123a) for exposing the connection electrode (CE) is formed on the first top gate (TGE1) is the second through a contact hole (123a) it may be electrically connected to the connecting electrode (CE). 상기 제1 및 제2 센서 트랜지스터(IRT, VST)의 상기 제1 및 제2 탑 게이트(TGE1, TGE2) 및 상기 제1 및 제2 스위칭 트랜지스터(SWT1, SWT2)의 더미 게이트 전극(TGE3, TGE4)은 제2 유기 절연막(124)에 의해서 커버될 수 있다. The first and the second sensor transistor (IRT, VST) of the first and second top gate (TGE1, TGE2) and the first and the dummy gate electrode (TGE3, TGE4) of the second switching transistor (SWT1, SWT2) of It can be covered by the second organic insulating layer 124. 상기 제2 유기 절연막(124) 상에는 상기 컬러필터층(125)이 형성된다. On the second organic insulating layer 124 is the color filter layer 125 is formed. 상기 컬러필터층(125)은 적색, 녹색, 및 청색 색화소(R, G, B)를 포함하고, 상기 적색, 녹색, 및 청색 색화소(R, G, B) 각각은 하나의 화소에 대응하여 구비될 수 있다. Each of the color filter layer 125 includes red, green, and blue color pixels (R, G, B) comprising, wherein the red, green, and blue color pixels (R, G, B) of the corresponding one pixel It may be provided. 상기 컬러필터층(125) 상에는 오버 코팅층(126)이 형성된다. The overcoat layer 126 is formed on the color filter layer 125 is formed. 상기 오버 코팅층(126) 상에는 상기 기준 전극(127)이 형성된다. The reference electrode 127 formed on the overcoat layer 126 is formed. 도 4를 참고하면, 상기 표시 패널(100)은 상기 제1 베이스 기판(111)의 하부에 구비된 제1 광학 필름(180) 및 상기 제2 베이스 기판(121) 상부에 구비된 제2 광학 필름(190)을 더 포함할 수 있다. Referring to Figure 4, the display panel 100 is the first of the first optical film 180 and the second the second optical film provided on the upper base substrate 121 provided on the lower portion of the base substrate 111 It may further include a 190. 상기 제1 및 제2 광학 필름(180, 190) 각각은 편광 필름을 포함할 수 있다. Each of the first and second optical film (180, 190) may comprise a polarizing film. 상기 제2 광학 필름(190) 상에는 상기 표시 패널(100)을 외부의 충격 등으로부터 보호하기 위한 보호 기판(300)을 더 포함할 수 있다. The second is an optical film 190. The display panel 100 is formed on the can further include a protection circuit board 300 to protect against such an external impact. 상기 제1 및 제2 광학 필름(180, 190) 및 상기 보호 기판(300)에 관하여는 아래에 첨부된 도면을 참고하여 구체적으로 설명한다. With respect to the first and second optical film (180, 190) and the protection circuit board 300, refer to the accompanying drawings, the following will be described in detail. 도 5를 참고하면, 상기 제2 광학 필름(190)은 일 방향으로 편광된 광을 투과시키고 상기 일 방향과 실질적으로 수직한 다른 방향으로 편광된 광을 흡수하는 편광 필름(192)을 포함한다. Referring to FIG. 5, the second optical film 190 and transmitted through the polarized light in one direction includes a polarizing film (192) that absorbs light polarized in another direction orthogonal to the one direction and substantially. 상기 편광 필름(192)은, 예를 들어 폴리비닐알코올(Poly Vinyl Alcohol, PVA)을 포함할 수 있다. The polarization film 192 is, for example, may include a polyvinyl alcohol (Poly Vinyl Alcohol, PVA). 또한, 상기 제2 광학 필름(190)은 상기 편광 필름(192)과 상기 제2 기판(120) 사이에 구비된 제1 보호 필름(191) 및 상기 편광 필름(192)을 사이에 두고 상기 제1 보호 필름(191)과 마주하여 구비된 제2 보호 필름(193)을 포함할 수 있다. Also, the second optical film 190 is interposed between the first protective film 191 and the polarizing film 192 is provided between the polarizing film 192 and the second substrate 120, the first equipped to face the protection film 191, it is possible to include a second protective film (193). 상기 제1 및 제2 보호 필름(191, 193)은 상기 편광 필름(192)을 사이에 두고 서로 마주하여 구비되어 상기 편광 필름(192)을 보호하고 지지하며, 예를 들어 트리아세틸셀룰로오스(Tri Acetyl Cellulose, TAC)를 포함할 수 있다. The first and the second protection film (191, 193) is provided by sandwiching face each other with the polarizing film 192 to protect and support the polarizing film 192, for example, triacetyl cellulose (Tri Acetyl It may include Cellulose, TAC). 상기 보호 기판(300)은 상기 제2 광학 필름(190) 상에 구비되어 상기 제2 광학 필름(190)을 보호하는 투명 기판(310)을 포함한다. The protective circuit board 300 includes a transparent substrate 310 that is provided on the second optical film 190 protects the second optical film (190). 상기 투명 기판(310)은 입사된 광을 투과시키는 투명한 물질로 구성되며, 예를 들어 유리 기판, 또는 플라스틱 기판일 수 있다. The transparent substrate 310 is composed of a transparent material for transmitting incident light, for example, be a glass substrate, or a plastic substrate. 상기 보호 기판(300)은 상기 투명 기판(310)과 상기 제2 광학 필름(190) 사이에 구비된 굴절률 보상막(320)을 더 포함할 수 있다. The protective circuit board 300 may further include a refractive index compensation layer 320 provided between the transparent substrate 310 and the second optical film (190). 상기 굴절률 보상막(320)은 상기 투명 기판(310) 및 상기 제2 보호 필름(193) 사이의 굴절률을 갖는 막으로 상기 제2 보호 필름(193)에서 출사된 광이 상기 투명 기판(310)을 투과할 때, 상기 투명 기판(310)에서 반사되는 광의 비율을 감소시킬 수 있다. The refractive index compensation film 320 is the transparent substrate 310 and the second protective film 193 as a film having a refractive index of the light emitted in the second passivation film 193, the transparent substrate 310 between when transmitting, it is possible to reduce the proportion of light reflected by the transparent substrate 310. 구체적으로, 굴절률이 서로 다른 두 물질의 경계면에서의 광의 반사율(R)은 다음의 수학식 1로 정의된다. 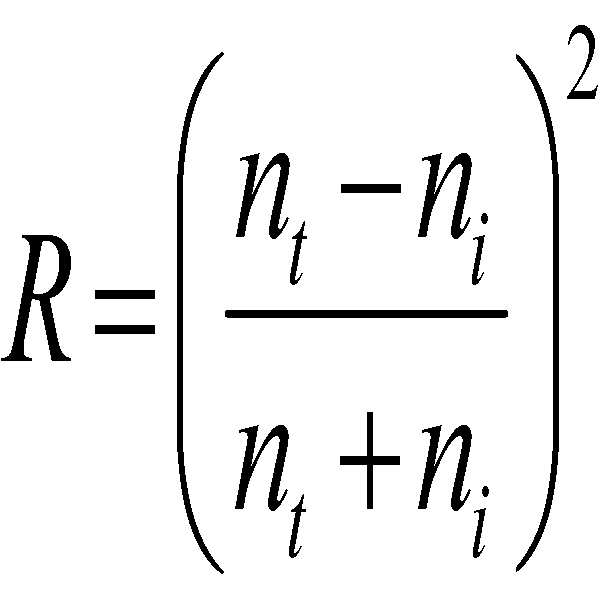 Specifically, the light reflectivity (R) at the interface of two materials with different refractive index is defined by the following equation (1). 이때, n t 는 광이 경계면에서 출사되는 물질의 굴절률이고, n i 는 광이 경계면에서 입사되는 물질의 굴절률이다. At this time, n t is a refractive index of a material in which light is emitted from the boundary, n i is the refractive index of the material which the light is incident on the boundary surface. 수학식 1을 참고하면, 두 물질의 굴절률 차가 클수록, 경계면에서 광의 반사율이 큰 것을 알 수 있다. Referring to equation (1), the greater difference in refractive index of the two materials, it can be seen that at the interface is greater light reflectivity. 따라서, 도 5 및 수학식 1을 참고하면, 상기 투명 기판(310) 및 상기 제2 보호 필름(193) 사이에 공기층(AIR)이 형성된 경우에 비하여, 상기 투명 기판(310) 및 상기 제2 보호 필름(193) 사이에 굴절률 보상막(320)을 형성하는 경우, 상기 제2 보호 필름(193)에서 출사된 광이 상기 투명 기판(310)에 입사될 때에 상기 투명 기판(310)에서 반사되는 광의 비율을 감소시킬 수 있다. Thus, referring to Figure 5 and Equation (1), the transparent substrate 310 and the second protective film 193 as compared with the case in the air (AIR) is formed between the transparent substrate 310 and the second passivation when forming a refractive index compensation layer 320 between the film 193, the first light 2 emitted from the protective film 193, the light reflected by the transparent substrate 310 when it is incident on the transparent substrate (310) It can reduce the rate. 예를 들어, 상기 제2 기판(120)의 굴절률은 약 1.52이고, 상기 제1 및 제2 보호 필름(191, 193)의 굴절률은 약 1.48이며, 상기 편광 필름(192)의 굴절률은 약 1.52이고, 상기 투명 기판(310)의 굴절률은 약 1.52일 때, 상기 제2 보호 필름(193)과 상기 투명 기판(310) 사이에 약 1.50의 굴절률을 갖는 굴절률 보상막(320)을 사용할 수 있다. For example, the refractive index of the second substrate 120 is about 1.52, the first and the refractive index of the second protection film (191, 193) is about 1.48, the refractive index of the polarizing film 192 is about 1.52, and , the refractive index of the transparent substrate 310 may be a refractive index compensation film 320 has a refractive index of about 1.50 to about 1.52 between the time of day, the second protective film 193 and the transparent substrate 310. 다만, 상기 투명 기판(310)과 상기 투명 기판(310) 상부의 공기층(AIR)(매질이 약 1이다) 사이에는 약 0.52의 굴절률 차이가 발생하므로, 상기 백라이트 유닛(250)에서 발생된 광은 상기 투명 기판(310)에서 출사되어 공기층(AIR)으로 출사될 때 가장 큰 반사율을 갖는다. However, the upper portion of the transparent substrate 310 and the transparent substrate 310, air (AIR), so between (the medium is about 1 is a) is generated in the difference in refractive index of about 0.52, the light generated from the backlight unit (250) has the greatest reflectance time is emitted from the transparent substrate 310 to be emitted in the air (aIR). 도 6은 적외선 필터를 투과한 광의 파장에 대한 투과 세기를 나타내는 도면이다. 6 is a view showing the transmission strength for the wavelength of the light that has passed through the infrared filter. 구체적으로, 도 6은 상기 백라이트 유닛(250)에서 출사된 광이 상기 적외선 필터(128)를 투과한 후, 상기 투과된 광의 파장에 대한 투과 세기를 보여주는 도면이다. Specifically, Figure 6 is a view showing after the light emitted from the backlight unit 250 is transmitted through the infrared filter 128, the transmission for the wavelength of the transmitted light intensity. 도 6에서, 제1 그래프(G1)는 상기 적외선 필터(128)로 2100Å의 두께를 갖는 밴드 패스 필터를 사용한 경우의 파장에 대한 투과 세기를 나타내고, 제2 그래프(G2)는 상기 적외선 필터(128)로 포스핀(phosphine, PH3) 도핑된 밴드 패스 필터를 사용한 경우의 파장에 대한 투과 세기를 타내며, 제3 그래프(G3)는 상기 적외선 필터(128)로 게르마늄층 및 실리콘 게르마늄층이 각각 500Å 두께로 중첩된 밴드 패스 필터를 사용한 경우의 파장에 대한 투과 세기를 나타내고, 제4 그래프(G4)는 상기 적외선 필터(128)로 3000Å의 두께를 갖는 밴드 패스 필터를 사용한 경우의 파장에 대한 투과 세기를 나타낸다. In Figure 6, a first graph (G1) represents the transmission intensity of the wavelength in the case of using a band-pass filter having a 2100Å thick as the infrared filter 128, a second graph (G2) is the IR filter (128 ) with phosphine (phosphine, PH3) naemyeo take the transmission intensity of the wavelength in the case of using the doped band-pass filter, a third graph (G3) are respectively the germanium layer and the silicon germanium layer to the IR filter (128) 500Å represents the transmission intensity of the wavelength, the fourth graph (G4) in the case of using the band-pass filters overlap in a thickness of the transmission intensity of the wavelength in the case of using a band-pass filter having a 3000Å ​​thickness of said infrared filter (128) It represents an. 도 6을 참조하면, 상기 적외선 필터(128)는 적외선 영역에 패스 밴드를 갖는 필터이다. 6, the infrared filter 128 is a filter having a pass band in the infrared region. 따라서, 상기 적외선 필터(128)는 적외선 영역의 광을 투과시키나, 가시광도 상기 적외선 필터(128)를 투과하는 것을 볼 수 있다. Thus, the infrared filter 128 is sikina transmitting light in the infrared range, visible light can also be seen that passing through the infrared filter 128. 도 6에서 상기 적외선 영역의 광은 800nm 내지 900nm의 파장을 갖는 광을 말하고, 상기 가시광선은 600nm 내지 700nm의 파장을 갖는 광을 말한다. In Figure 6 the light in the infrared region; refers to light having a wavelength of 800nm ​​to 900nm, the visible light refers to light having a wavelength of 600nm to 700nm. 따라서, 도 4 및 도 6을 참조하면, 적외선 영역의 파장을 갖는 제1 광을 센싱하는 각 제1 센서(SN1) 상에, 구체적으로 각 제1 센서 트랜지스터(IRT) 상에 적외선 필터(128)를 사용하더라도, 상기 적외선 필터(128) 상부에 구비된 물질의 경계면에서 반사된 가시광선, 특히 상기 투명 기판(310)과 공기층(AIR) 사이의 경계면에서 반사된 가시광선이 다시 상기 제1 센서 트랜지스터(IRT)로 입력될 수 있음을 보여준다. Thus, Fig. 4 and 6, the infrared filter 128 onto a first light having a wavelength in the infrared region on each of the first sensor (SN1) to sense, in particular each of the first sensor transistor (IRT) wherein the even used, the visible light reflection at the interface between the infrared filter 128, a visible light reflection at the interface of the material provided in the upper part, especially the transparent substrate 310 and the layer of air (aIR) again, the first sensor transistor It shows that a (IRT) can be entered. 도 7은 도 4의 제2 기판, 광학 필름, 및 투명 기판을 간략하게 도시한 다른 실시예에 따른 단면도이다. 7 is a cross-sectional view according to another embodiment briefly shows the second substrate, an optical film, and the transparent substrate of Fig. 도 7의 구성 요소에 대한 설명에 있어서, 도 5에 도시된 구성과 동일한 구성에 대하여는 동일한 참조부호를 병기하고 구체적인 설명은 생략한다. In the description of the components of Figure 7, the configuration and the same reference numerals and a detailed description with respect to the same configuration shown in Figure 5 it will be omitted. 도 7을 참고하면, 상기 보호 기판(300)은 상기 투명 기판(310)을 사이에 두고 상기 편광 필름(192)과 마주하여 구비된 위상차 판(330)을 더 포함한다. Referring to Figure 7, the protection circuit board 300 further includes a retardation plate (330) provided sandwiched between the transparent substrate 310 to face the polarizing film 192. 상기 위상차 판(330)은 입사된 광의 편광 방향을 변경하는 것으로, 상기 위상차 판(330)은 상기 위상차 판(330)을 두 번 통과하는 광의 편광방향을 90도 변경시킨다. The retarder 330 is to change the polarization direction of incident light, thereby the phase difference plate 330 also changes the polarization direction of light passing through the phase difference plate 330, double-90. 구체적으로는 상기 투명 기판(310)을 통해 출사된 광이 상기 위상차 판(330)과 공기층(AIR)의 경계면에서 반사되어 다시 상기 투명 기판(310)으로 입사될 때, 상기 광의 위상을 90도 변경시킨다. Specifically, when the light emitted through the transparent substrate 310 to be incident on the back of the transparent substrate 310 is reflected by the boundary surface of the phase difference plate 330 and the layer of air (AIR), the phase of the light changes by 90 degrees thereby. 다시 말해, 상기 위상차 판(330)은 제1 방향으로 편광된 제1 광과 상기 제1 방향과 실질적으로 수직한 제2 방향으로 편광된 제2 광의 위상을 90도, 예를 들어 1/4 파장 변경시키는 광학 소자이다. In other words, the phase difference plate 330 is 90 degrees, the second phase of the light polarized light and a first light polarized in a first direction in the first direction and a second direction substantially perpendicular to, for example quarter-wave changing an optical element to. 구체적으로, 상기 위상차 판(330)은, 예를 들어, 상기 투명 기판(310)에서 출사된 상기 제1 방향으로 편광된 광이 상기 위상차 판(330)을 통과할 때 위상을 45도 변경시키고, 상기 공기층(AIR)에서 반사되어 다시 상기 위상차 판(330)을 통과할 때 위상을 45도 더 변경시켜, 상기 제1 방향으로 편광된 광을 상기 제2 방향으로 편광된 광으로 만든다. Specifically, the phase difference plate 330 is, for example, the light polarized in the first direction emitted from the transparent substrate 310 and the phase as it passes through the retarder 330, changes 45, by a phase as it passes through the reflection is the phase difference plate 330 again from the layer of air (aIR) changes 45 further, makes the light polarized in the first direction by the polarized light in the second direction. 따라서, 상기 위상차 판(330) 및 상기 공기층(AIR) 사이에서 반사된 광은 선편광된 광의 축이 90도 변경되므로, 상기 편광 필름(192)을 투과하지 못한다. Therefore, the retardation plate 330 and the light reflected between the air (AIR) is because the linearly polarized light axis is changed by 90 degrees and does not pass through the polarizing film 192. 상기 위상차 판(330)은, 예를 들어, 4분 파장판일 수 있다. The retarder 330 may be, for example, 4 minutes panil wavelength. 또한, 상기 위상차 판(330)은 600nm 내지 750nm인 파장을 갖는 광의 위상을 빠른축과 느린축의 위상차가 90도가 되도록 변경시킬 수 있다. Furthermore, the retarder 330 can be changed so that degrees 600nm to 750nm in wavelength is fast axis and the slow axis 90 of the light phase having a phase difference. 따라서, 상기 위상차 판(330)의 스펙트럼 상 중심 파장은 600nm 내지 750nm 사이의 값을 가질 수 있다. Therefore, the center wavelength of the spectrum of the phase difference plate 330 may have a value of between 600nm to 750nm. 도 8a는 도 7의 편광 필름의 투과축과 위상차 판의 지연축의 위치 관계를 설명하는 도면이고, 도 8b는 도 7의 위상차 판에서 광의 위상이 변경되는 과정을 설명하는 도면이다. Figure 8a is a view for explaining the process of Fig. Is a view for explaining the transmission delay between the axis position of the axis and the retardation film of the polarizing film of 7, Figure 8b is a phase of light changes in the phase difference plate of Fig. 도 8a를 참고하면, 상기 편광 필름(192)의 투과축(TA)은 제1 방향(D1)과 나란하게 형성되고, 상기 위상차 판(330)의 지연축(SA)은 상기 제1 방향(D1)과 θ만큼 각도진 제3 방향(D3)과 나란하게 형성될 수 있다. Referring to Figure 8a, the transmission axis (TA) is the first direction (D1) and being parallel to the formation, slow axis (SA) of the phase shift plate 330 is in the first direction (D1 of the polarizing film 192, ) and it may be formed side by side with the binary angle θ by a third direction (D3). 상기 각(θ)은 약 45도일 수 있으나, 실시형태에 따라, 상기 각(θ)은 약 20도 내지 약 70도 사이의 범위 내에서 형성될 수 있다. Wherein each (θ) is about 45 degrees, but can, according to the embodiment, the angle (θ) may be formed within a range of between about 20 degrees to about 70 degrees. 도 8b를 참고하면, 상기 편광 필름(192)에서 출사된 제1 가시광(L1)은 제1 방향(D1)으로 편광된 광으로 상기 위상차 판(330)으로 입사된다. Referring to FIG. 8b, the first visible light (L1) emitted from the polarizing film 192 is incident on the retarder 330, the light polarized in the first direction (D1). 구체적으로, 상기 제1 가시광(L1)은 파장이 600nm 내지 750nm 사이의 값을 가질 수 있다. Specifically, the first visible light (L1) may have a value between a wavelength of 600nm to 750nm. 상기 위상차 판(330)에 입사된 제1 가시광(L1)은 상기 위상차 판(330)과 상기 위상차 판(330) 상부의 공기층(AIR) 사이의 경계면에 도달될 때까지 빠른축과 느린축의 위상차가 90도가 되도록 변경된다. A first visible light (L1) incident on the retarder 330 is the fast axis and the slow axis phase until it reaches the interface between the retarder 330 and the retarder 330, the air layer of the upper (AIR) It is changed to 90 degrees. 즉, 상기 제1 가시광(L1)은 상기 제1 방향(D1)으로 선편광된 상태에서 원편광 상태로 변경된다. That is, the first visible light (L1) is changed to circular polarization state in a state in which linearly polarized in the first direction (D1). 상기 위상차 판(330)과 상기 공기층(AIR)의 경계면에서 상기 제1 가시광(L1)의 일부는 상기 공기층(AIR)으로 입사되고, 상기 제1 가시광(L1)의 다른 일부는 상기 위상차 판(330)과 상기 공기층(AIR)의 경계면에서 반사되어 제2 가시광(L2)으로서 다시 상기 위상차 판(330)을 통과한다. At the boundary of the phase shift plate 330 and the layer of air (AIR), a portion of the first visible light (L1) is incident on the layer of air (AIR), the first other part is the phase difference plate (330 of visible light (L1) ) and passed through the back retardation plate 330 it is reflected by the boundary surface as the second visible light (L2) of the air (aIR). 상기 제2 가시광(L2)은 상기 위상차 판(330)을 다시 통과할 때, 빠른축과 느린축의 위상차가 없어지도록 변경된다. The second visible light (L2) is to pass through the phase difference plate 330 again and is changed fast axis and the slow axis, so that the phase difference disappears. 즉, 상기 원편광된 제2 가시광(L2)는 제2 방향(D2)으로 선편광된다. In other words, the second visible light (L2) of the circularly polarized light is linearly polarized in a second direction (D2). 따라서, 상기 위상차 판(330)에서 상기 투명 기판(310)으로 출사된 제2 가시광(L2)은 제2 방향(D2)으로 선편광되어 상기 편광 필름(192)에서 출사된 제1 가시광(L1)에 비하여 선편광된 방향이 90도 변경된다. Therefore, the transparent substrate 310, the second visible light (L2) emitted in is linearly polarized in a second direction (D2) of the first visible light (L1) emitted from the polarization film 192 in the retarder 330 the direction of linear polarization than 90 is also changed. 다시 말해, 상기 위상차 판(330)과 상기 공기층(AIR)의 경계면에서 반사된 제2 가시광(L2)의 편광 방향은 상기 제2 방향(D2)이고 상기 편광 필름(192)에서 출사된 제1 가시광(L1)의 편광 방향은 상기 제1 방향(D1)이므로, 상기 제2 가시광(L2)은 상기 제1 방향(D1)의 투과축(TA)을 갖는 상기 편광 필름(192)을 투과하지 못하고 상기 편광 필름(192)에서 흡수된다. In other words, the polarization direction of the second visible light (L2) reflected on the boundary surface of the phase difference plate 330 and the layer of air (AIR) is the second direction (D2) and the first visible light emitted from the polarization film 192, Since the polarization direction of the (L1) is the first direction (D1), said second visible light (L2) is unable to transmitted through the polarizing film 192 having a transmission axis (TA) in the first direction (D1) the It is absorbed in the polarization film 192. 결과적으로, 상기 위상차 판(330)은 600nm 내지 750nm인 파장을 갖는 광의 위상을 변경시켜 상기 제1 센서 트랜지스터(IRT)로 입력되는 것을 방지하여, 상기 제1 센서(SN1)의 성능을 향상시킬 수 있다. As a result, the retarder 330 can be prevented from by changing the phase of light having a wavelength of 600nm to 750nm which is input to the first sensor transistor (IRT), improves the performance of the first sensor (SN1) have. 도 9는 도 4의 제2 기판, 제2 광학 필름, 및 보호 기판을 간략하게 도시한 또 다른 실시예에 따른 단면도이다. 9 is a cross-sectional view according to a second substrate, a second optical film, and a still another aspect briefly showing a protective plate of Example 4. 도 9의 구성 요소에 대한 설명에 있어서, 도 5에 도시된 구성과 동일한 구성에 대하여는 동일한 참조부호를 병기하고 구체적인 설명은 생략한다. In the description of the components of Figure 9, the configuration and the same reference numerals and a detailed description with respect to the same configuration shown in Figure 5 it will be omitted. 도 9를 참조하면, 상기 제2 광학 필름(190)은 편광 필름(192), 상기 편광 필름(192)과 상기 제2 기판(120) 사이에 구비된 보호 필름(191), 및 상기 편광 필름(192)을 사이에 두고 상기 보호 필름(191)과 마주하여 구비된 위상차 판(194)을 포함한다. 9, the second optical film 190 may be a polarizing film 192, a protective film 191, and the polarizing film provided between the polarizing film 192 and the second substrate 120 ( across the 192) comprises a retardation plate (194) provided to face the protection film 191. 도 9에 도시된 위상차 판(194)의 광학적 특성은 실질적으로 도 7에 도시된 위상차 판(330)과 동일하다. Optical properties of the phase shift plate 194 shown in Figure 9 is the same as substantially the retarder 330 shown in Fig. 상기 위상차 판(194)은 입사된 광의 편광 방향을 변경하고, 상기 편광 필름(192)을 지지한다. The phase difference plate 194 is changed to the incident polarization direction, and supporting the polarizing film (192). 구체적으로, 상기 위상차 판(194)은 상기 편광 필름(192)을 통해 출사된 광이 상기 투명 기판(310)과 공기층(AIR)의 경계면에서 반사되어 다시 상기 편광 필름(192)으로 입사될 때, 상기 광의 위상을 180도 변경시킨다. Specifically, when the phase difference plate 194 to be incident on the light emitted through the polarizing film 192 to the polarizing film 192 is again reflected by the boundary surface of the transparent substrate 310 and the layer of air (AIR), the phase of light thereby also change 180. 도 10은 도 4의 제2 기판, 제2 광학 필름, 및 보호 기판을 간략하게 도시한 또 다른 실시예에 따른 단면도이다. 10 is a cross-sectional view according to a second substrate, a second optical film, and a still another aspect briefly showing a protective plate of Example 4. 도 10의 구성 요소에 대한 설명에 있어서, 도 7에 도시된 구성과 동일한 구성에 대하여는 동일한 참조부호를 병기하고 구체적인 설명은 생략한다. In the description of the components of Figure 10, the configuration and the same reference numerals and a detailed description with respect to the same configuration shown in Fig. 7 will be omitted. 도 10을 참고하면, 상기 보호 기판(300)은 상기 위상차 판(330)을 사이에 두고 상기 투명 기판(310)과 마주하여 구비된 저 굴절률 필름(340)을 더 포함한다. Referring to Figure 10, the protective circuit board 300 further includes a low-refractive-index film (340) provided by sandwiching the retardation plate 330 facing the transparent substrate (310). 상기 저 굴절률 필름(340)은 1보다 크고 약 1.45보다 작은 굴절률을 가져, 상기 위상차 판(330)과 상기 공기층(AIR) 사이의 경계면에서 상기 위상차 판(330)과 상기 공기층(AIR) 간의 큰 굴절률 차로 인한 광의 반사를 감소시킨다. The low-refractive film 340 is a large refractive index between larger than 1 and bring a small index of refraction greater than about 1.45, the phase difference plate 330 and the layer of air (AIR), the retarder 330 and the layer of air (AIR) at the interface between the It reduces the reflection of light caused by car. 이상 실시예를 참조하여 설명하였지만, 해당 기술 분야의 숙련된 당업자는 하기의 특허 청구의 범위에 기재된 본 발명의 사상 및 영역으로부터 벗어나지 않는 범위 내에서 본 발명을 다양하게 수정 및 변경시킬 수 있음을 이해할 수 있을 것이다. Above embodiment has been with reference to describe, understand that without departing from the spirit and scope of the invention defined in the claims below are those skilled in the art can make various modifications and variations to the present invention It will be. 또한 본 발명에 개시된 실시예는 본 발명의 기술 사상을 한정하기 위한 것이 아니고, 하기의 특허 청구의 범위 및 그와 동등한 범위 내에 있는 모든 기술 사상은 본 발명의 권리범위에 포함되는 것으로 해석되어야 할 것이다. Further embodiments disclosed herein are all spirits within a scope equivalent to the scope and the claims below, not intended to limit the technical idea of ​​the present invention will be construed as included in the scope of the present invention . 상기 편광 필름을 사이에 두고 상기 표시 패널과 마주하여 구비되는 위상차 판을 포함하고, 상기 위상차 판은 상기 위상차 판을 두 번 통과하는 광의 편광방향을 90도 변경하는 것을 특징으로 하는 표시 장치. Sandwiching the polarizing film display device of the polarization direction of light, including a retardation plate is provided to face the display panel and passes the phase difference plate is the phase plate twice characterized in that it changes by 90 degrees. 제1항에 있어서, 상기 위상차 판은 상기 제1 방향으로 편광된 광이 상기 위상차 판을 두 번 통과될 때 상기 광의 편광 방향을 상기 제2 방향으로 변경하는 것을 특징으로 하는 표시 장치. The method of claim 1 wherein the retarder is a display device, characterized in that for changing the polarization direction of light, when the light polarized in the first direction is passed through the retarder twice in the second direction. 제1항에 있어서, 상기 편광 필름을 사이에 두고 상기 표시 패널과 마주하여 구비되어 상기 표시 패널을 보호하는 투명 기판을 더 포함하는 것을 특징으로 하는 표시 장치. The method of claim 1 wherein interposed between the polarizing film is provided to face the display panel, the display device further comprises a transparent substrate for protecting the display panel. 제3항에 있어서, 상기 위상차 판은 상기 투명 기판을 사이에 두고 상기 편광 필름과 마주하여 구비되는 것을 특징으로 하는 표시 장치. The method of claim 3, wherein the retarder is a display device, characterized in that interposed between the transparent substrate which is provided to face the polarizing film. 제4항에 있어서, 상기 위상차 판을 사이에 두고 상기 투명 기판과 마주하여 구비되며 상기 위상차 판의 굴절률 및 공기의 굴절률 사이의 굴절률을 갖는 저 굴절률 필름을 더 포함하는 것을 특징으로 하는 표시 장치. 5. The method of claim 4, interposed between the phase difference plate is provided to face the transparent substrate, the display device further comprises a low refractive index film having a refractive index between the refractive index of the refractive index of air and of the phase difference plate. 제4항에 있어서, 상기 위상차 판은 4분 파장판인 것을 특징으로 하는 표시 장치. The method of claim 4, wherein the retarder is a display device, characterized in that four minutes wave plate. 제6항에 있어서, 상기 4분 파장판은 600nm 내지 750nm인 파장을 갖는 광에 대해 4분의 1 파장의 위상차를 만드는 것을 특징으로 하는 표시 장치. 7. The method of claim 6 wherein the 4 minutes wave plate is a display device, characterized in that to create a phase difference of one-quarter wavelength for light having a wavelength of 600nm to 750nm. 제4항에 있어서, 상기 위상차 판의 지연축과 상기 제1 방향 사이의 각은 20도 내지 70도인 것을 특징으로 하는 표시 장치. The method of claim 4, wherein the angle between the slow axis of the retarder and the first direction is a display device, characterized in that degrees to 70 degrees 20. 제8항에 있어서, 상기 위상차 판의 지연축과 상기 제1 방향 사이의 각은 45도인 것을 특징으로 하는 표시 장치. The method of claim 8 wherein the angle between the slow axis of the retarder and the first direction is the display device according to claim 45 degrees. 제4항에 있어서, 상기 투명 기판 및 상기 편광 필름 사이에 구비되고 상기 투명 기판의 굴절률과 상기 편광 필름의 굴절률 사이의 굴절률을 갖는 굴절률 보상막을 더 포함하는 것을 특징으로 하는 표시 장치. The method of claim 4, wherein the display device further comprises is provided between the transparent substrate and the polarizing film, the refractive index compensation film having the refractive index between the refractive index and the refractive index of the polarizing film of the transparent substrate. 제4항에 있어서, 상기 제1 기판에 인접하게 구비되어 상기 표시 패널로 광을 공급하는 복수의 광원을 더 포함하고, 상기 편광 필름은 상기 제2 기판 상에 구비되는 것을 특징으로 하는 표시 장치. 5. The method of claim 4, are provided adjacent to the first board display device, characterized in that provided on, on the second substrate on which the polarizing film is further comprising a plurality of light sources for supplying light to the display panel. 제3항에 있어서, 상기 위상차 판은 상기 편광 필름 및 상기 투명 기판 사이에 구비되는 것을 특징으로 하는 표시 장치. The method of claim 3, wherein the retarder is a display device characterized in that provided between the polarizing film and the transparent substrate. 제12항에 있어서, 상기 위상차 판을 사이에 두고 상기 편광 필름과 마주하여 구비되며 상기 위상차 판의 굴절률 및 공기의 굴절률 사이의 굴절률을 갖는 저 굴절률 필름을 더 포함하는 것을 더 포함하는 것을 특징으로 하는 표시 장치. 13. The method of claim 12, sandwiched between the phase difference plate is provided to face the polarizing film according to claim 1, further comprising further comprising a low refractive index film having a refractive index between the refractive index of the refractive index and the air of the retarder display device. 제12항에 있어서, 상기 위상차 판은 4분 파장판인 것을 특징으로 하는 표시 장치. The method of claim 12, wherein the retarder is a display device, characterized in that four minutes wave plate. 제14항에 있어서, 상기 4분 파장판은 600nm 내지 750nm인 파장을 갖는 광에 대해 4분의 1 파장의 위상차를 만드는 것을 특징으로 하는 표시 장치. 15. The method of claim 14, wherein four minutes wave plate is a display device, characterized in that to create a phase difference of one-quarter wavelength for light having a wavelength of 600nm to 750nm. 제12항에 있어서, 상기 위상차 판의 지연축과 상기 제1 방향 사이의 각은 20도 내지 70도인 것을 특징으로 하는 표시 장치. The method of claim 12, wherein the angle between the slow axis of the retarder and the first direction is a display device, characterized in that degrees to 70 degrees 20. 제16항에 있어서, 상기 위상차 판의 지연축과 상기 제1 방향 사이의 각은 45도인 것을 특징으로 하는 표시 장치. The method of claim 16, wherein the angle between the slow axis of the retarder and the first direction is the display device according to claim 45 degrees. 제12항에 있어서, 상기 투명 기판 및 상기 위상차 판 사이에 구비되고 상기 투명 기판의 굴절률과 상기 위상차 판의 굴절률 사이의 굴절률을 갖는 굴절률 보상막을 더 포함하는 것을 특징으로 하는 표시 장치. The method of claim 12, wherein the display device further comprises is provided between the transparent substrate and the refractive index of the retardation plate compensating film having a refractive index between the refractive index and the refractive index of the retardation film of the transparent substrate. 제12항에 있어서, 상기 제1 기판에 인접하게 구비되어 상기 표시 패널로 광을 공급하는 복수의 광원을 더 포함하고, 상기 편광 필름은 상기 제2 기판 상에 구비되는 것을 특징으로 하는 표시 장치. 13. The method of claim 12, is provided adjacent to the first board display device, characterized in that provided on, on the second substrate on which the polarizing film is further comprising a plurality of light sources for supplying light to the display panel. 제1항에 있어서, 상기 위상차 판은 선편광되어 입사되는 광을 원편광시키는 것을 특징으로 하는 표시 장치. The method of claim 1, wherein the display device, comprising a step of the phase difference plate is circularly polarized light that is incident linearly polarized light.